There is only one test! A few weeks ago I started reading reddit/r/statistics regularly. I post links to this blog there and the readers have given me some good feedback. And I have answered a few questions. 2) There is only one test! Let me explain. All tests try to answer the same question: "Is the apparent effect real, or is it due to chance?" To answer that question, we formulate two hypotheses: the null hypothesis, H0, is a model of the system if the effect is due to chance; the alternate hypothesis, HA, is a model where the effect is real. Ideally we should compute the probability of seeing the effect (E) under both hypotheses; that is P(E | H0) and P(E | HA). But formulating HA is not always easy, so in conventional hypothesis testing, we just compute P(E | H0), which is the p-value. If the p-value is small, we conclude that the effect is unlikely to have occurred by chance, which suggests that it is real. That's hypothesis testing. All of the so-called tests you learn in statistics class are just ways to compute p-values efficiently. When computation was expensive, these shortcuts were important, but now that computation is virtually free, they are not. And the shortcuts are often based on simplifying assumptions and approximations. If you violate the assumptions, the results can be misleading, which is why statistics classes are filled with dire warnings and students end up paralyzed with fear. Fortunately, there is a simple alternative: simulation. If you can construct a model of the null hypothesis, you can estimate p-values just by counting. This figure shows the structure of the simulation. 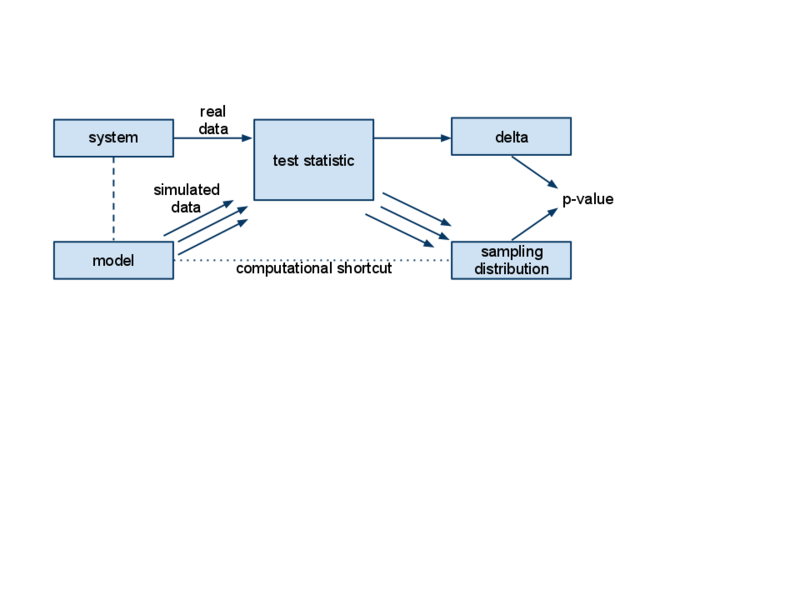 The first step is to get data from the system and compute a test statistic. The result is some measure of the size of the effect, which I call "delta". For example, if you are comparing the mean of two groups, delta is the difference in the means. If you are comparing actual values with expected values, delta is a chi-squared statistic (described below) or some other measure of the distance between the observed and expected values. The null hypothesis is a model of the system under the assumption that the apparent effect is due to chance. For example, if you observed a difference in means between two groups, the null hypothesis is that the two groups are the same. The next step is to use the model to generate simulated data that has the sample size as the actual data. Then apply the test statistic to the simulated data. The last step is the easiest; all you have to do is count how many times the test statistic for the simulated data exceeds delta. That's the p-value. What is the probability of seeing results like this by chance? The null hypothesis is that the die is fair. Under that assumption, the expected frequency for each value is 10, so the frequencies 8, 9 and 10 are not surprising, but 6 is a little funny and 19 is suspicious. Why relative? Because the variation in the observed values depends on the expected value. Why squared? Well, squaring makes the differences positive, so they don't cancel each other when we add them up. But other than that, there is no special reason to choose the exponent 2. The absolute value would also be a reasonable choice. For the observed frequencies, the chi-squared statistic is 20.6. By itself, this number doesn't mean anything. We have to compare it to results from the null hypothesis. """Generates a Hist of simulated die rolls. Out of 1000 simulations, only 34 generated a chi-squared value greater than 20.6, so the estimated p-value is 3.4%. I would characterize that as borderline significant. Based on this result, I think the die is probably crooked, but would I have the guy whacked? No, I would not. Maybe just roughed up a little. For this problem, I could have computed the sample distribution of the test statistic analytically and computed the p-value quickly and exactly. If I had to run this test many times for large datasets, computational efficiency might be important. But usually it's not. And accuracy isn't very important either. Remember that the test statistic is arbitrary, and the null hypothesis often involves arbitrary choices, too. There is no point in computing an exact answer to an arbitrary question. For most problems, we only care about the order of magnitude: if the p-value is smaller that 1/100, the effect is likely to be real; if it is greater than 1/10, probably not. If you think there is a difference between a 4.8% (significant!) and 5.2% (not significant! ), you are taking it too seriously. 1) Analysis often dictates the test statistic; simulation lets you choose whatever test statistic is most appropriate. For example, if someone is cheating at craps, they will load the die to increase the frequency of 3 and/or 4, not 1 and/or 6. So in the casino problem the results are suspicious not just because one of the frequencies is high, but also because the frequent value is 3. We could construct a test statistic that captures this domain knowledge (and the resulting p-value would be lower). 2) Analytic methods are inflexible. If you have issues like censored data, non-independence, and long-tailed distributions, you won't find an off-the-shelf test; and unless you are a mathematical statistician, you won't be able to make one. With simulation, these kinds of issues are easy. 3) When people think of analytic methods as black boxes, they often fixate on finding the right test and figuring out how to apply it, instead of thinking carefully about the problem. In summary, don't worry about finding the "right" test. There's no such thing. Put your effort into choosing a test statistic (one that reflects the effect you are testing) and modeling the null hypothesis. Then simulate it, and count! Added June 24, 2011: For some additional examples, see this followup post. I am leading a statistics workshop based on Think Stats tomorrow. If you want to follow along at home, my notes and the exercises are here. No statistics today, just news. I signed a contract with O'Reilly to publish Think Stats. I turn in the manuscript next week, and it should be out in June. So if you find any errors, now is the time to tell me! Here's my new author page at O'Reilly. Some people have asked if I get to choose the animal on the cover (which is a signature of O'Reilly cover design). The short answer is no. 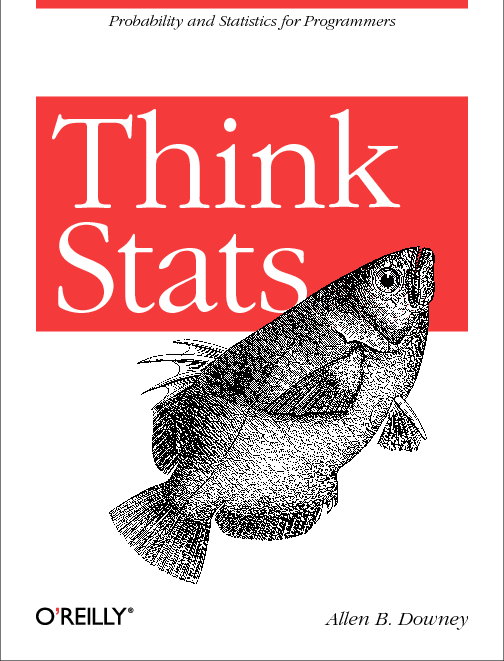 First, I'm actually not sure whether Think Stats will be an "animal book" or part of another O'Reilly series. We haven't talked about it. The purpose of a book cover is to get a potential reader to pick up the book, and to persuade a bookstore to display it. We're confident that we have the most striking and effective covers in technical publishing. Despite our relatively small size, it's not unusual to see window displays of our books at technical bookstores. I ask the authors to supply me with a description of the topic of the book. What I am looking for is adjectives that really give me an idea of the "personality" of the topic. Authors are free to make suggestions about animals, but I prefer to deal with adjectives. Once I have the information from the author, I spend some time thinking about it, and then I choose an animal. Sometimes it is based on no more than what the title sounds like. (COFF, for example, sounded like a walrus noise to me.) Sometimes it is very much linked to the name of the book or software. (For example, vi, the "Visual Editor," suggested some beast with huge eyes). And it is always subject to what sort of artwork I can find. It seems to work best this way. We've tried doing animals that the authors want, and have found that it works better if I do the selection, and then submit it for approval. I don't think anyone has been too disappointed with the final choices we've made. I'll add that if you do want a particular animal, Edie is more inclined to respond to "right brain" reasons than to obvious mental associations. For example, several people on the net suggested the obvious clam for the Perl handbook, but Edie responded instead to Larry Wall's obscure argument for the camel: ugly but serviceable, able to go long distances without a lot of nourishment. In any event, you'll have a chance to see and comment on Edie's cover design before we commit it to print. If you really hate it, and can't be persuaded to feel otherwise, she'll probably try again (but no promises!). So here's what I have for "right brain" ideas: the themes of the books are curiosity and analysis. One of the problems I see with conventional approaches to statistics is that it makes people timid -- afraid to do the wrong thing. One of my goals with this approach is to help students be fearless. So I want something curious and fearless. Ideas? Here's another article about the animal selection process. And here's the list of animals they've already used. The line drawing looks better at higher resolution, but you get the idea. Can anyone name that fish?